One of the things that makes the synthesizer beautiful is that, in some ways, it’s an extension of the voice. From the synthesizer’s early history, entangled with the Theremin and vocoder, to crossovers with vocal synthesis and artificial song, synthesis gives us another means to sing. So PPG Phonem is a lovely addition to that history. Creator Wolfgang Palm has made this a labor of love of late, and he’s on a roll with new synths for computer and iOS. The inventer of wavetable synthesis as we know it and founder/owner of PPG, he’s got the resumé, for sure. You can think of your own vocal utterance as built around a resonant filter. Here, accordingly, a multi resonator filter with 12 individual resonators acts as the heart of the synth. And that can be as synth-like, or as voice-like as you wish – from sounds that seem to be artificial singers to those that you’re just imagining. Let’s see the specs. What’s most interesting to me is the ability to create you own sounds and styles, fabricated from a huge library of phonemes (think “ooh,” “aah,” etc.). That’s combined with wavetable, samples, or vocal sources, making this a kind of hybrid synth – and a nice companion to WaveGenerator. As per usual, Wolfgang gives us morphing X/Y pads to manage all the envelopes and modulation that are available, plus ample effects to make this an all-in-one instrument. And all the inter-app tools are there, too, for integration with your mobile studio (IAA, Audiobus, AudioCopy, complete MIDI). 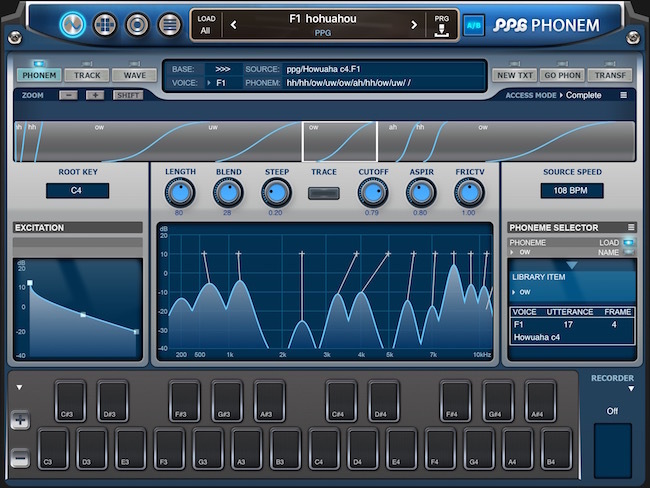 If you prefer desktop use, though, PPG Phonem is available as a plug-in, too. 4 Keypads play modes: Poly, Mono, Legato and Multitrigger. 4 MIDI modes: Poly, Mono, Legato and Voice-Per-Channel. I imagine a thousand underground SoundCloud hits are going to be launched by this one.